More fall fun is happening around here! 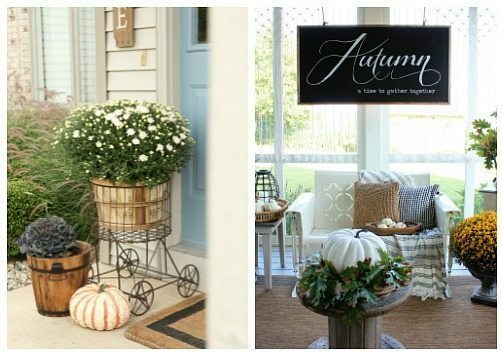 Decorating our porch for the different seasons is one of my favorite things to do. I always say, if you only have time/budget for minimal seasonal decor, start with your porch! It’s the place that most people can see and it makes your home feel welcoming. This weekend I finished up our Elegant Fall Porch Design for this year. 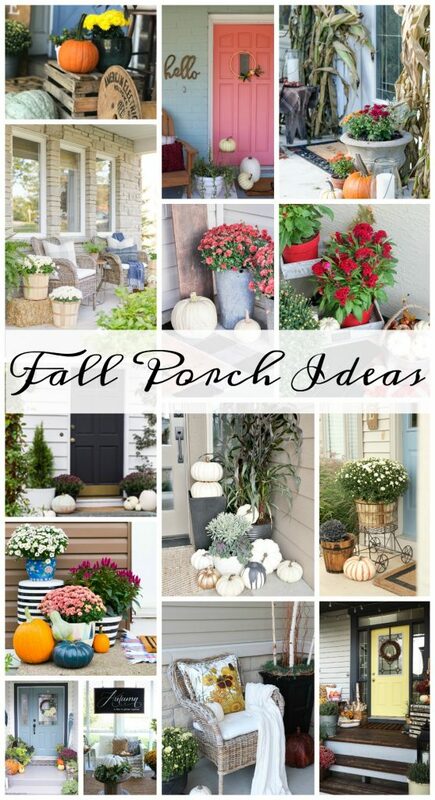 You can also scroll down to see 13 other fall porches from other home decor bloggers. 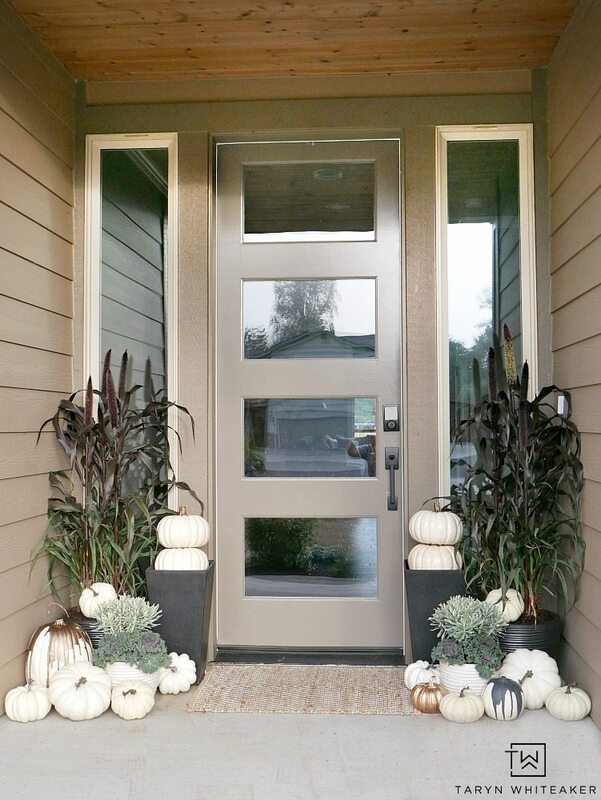 For this year’s fall porch design, I knew white pumpkins would be involved. Lots of them! But that was a given since I have actually only used white pumpkins on my porch since I started decorating it years ago. For the overall look, I wanted to go with a more modern, elegant and classy look. I’ve been using a lot of deep earth tones in my fall decor this year and I think this millet grass was the perfect touch. I have actually really liked the past few fall porches I’ve done at this house, I did a black, white and red fall porch, and then last year did a mixture of brown tones mixed with metallics. I loved both of them, so I incorporated elements from both previous porches into this one. I made these pumpkin topiaries a few years ago and decided to bring them back out this year. I think they have such a timless and classy look and they really frame the door way. 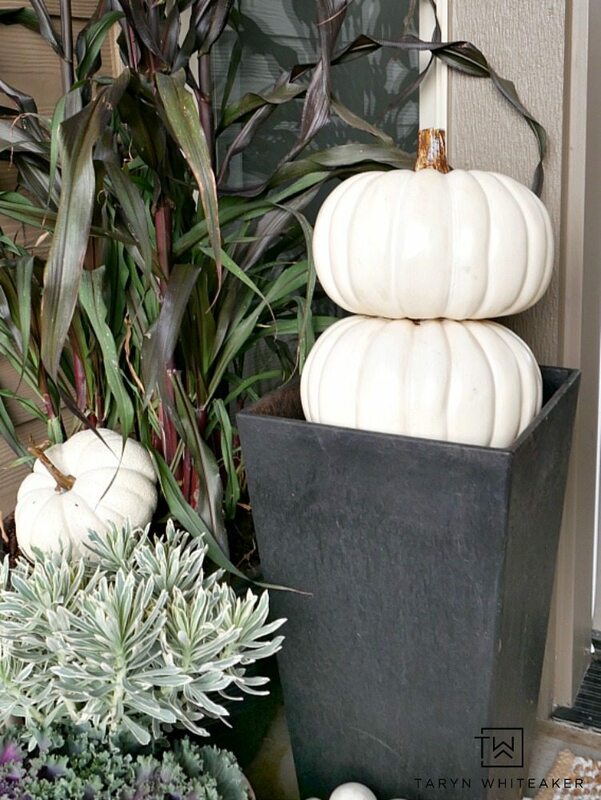 White pumpkins are seriously my fall love language. You can honestly never have too many of them. You don’t want to know how many boxes of I have of them in the garage! And that leads me to my next point, yes these are ALL faux pumpkins. 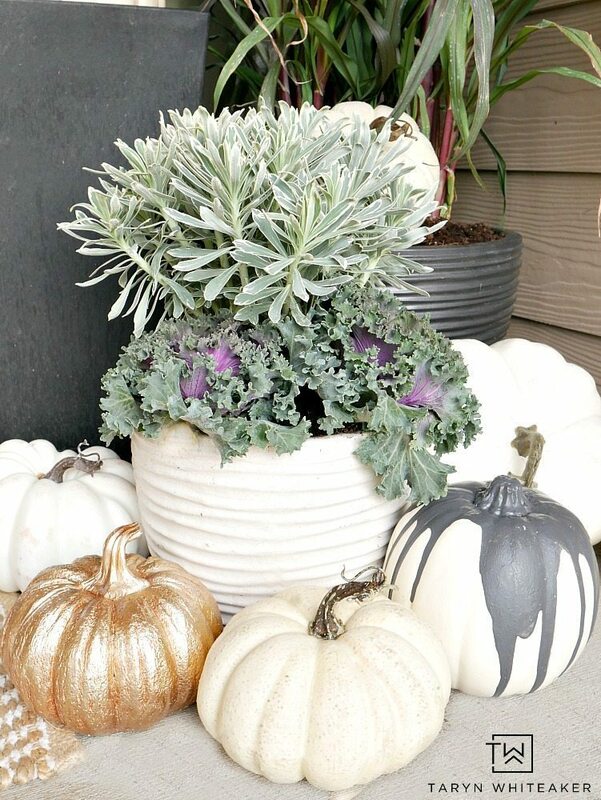 I am typically not someone who likes a lot of faux flowers and plants, but over the years Michaels has really perfected their faux pumpkins and gourds. 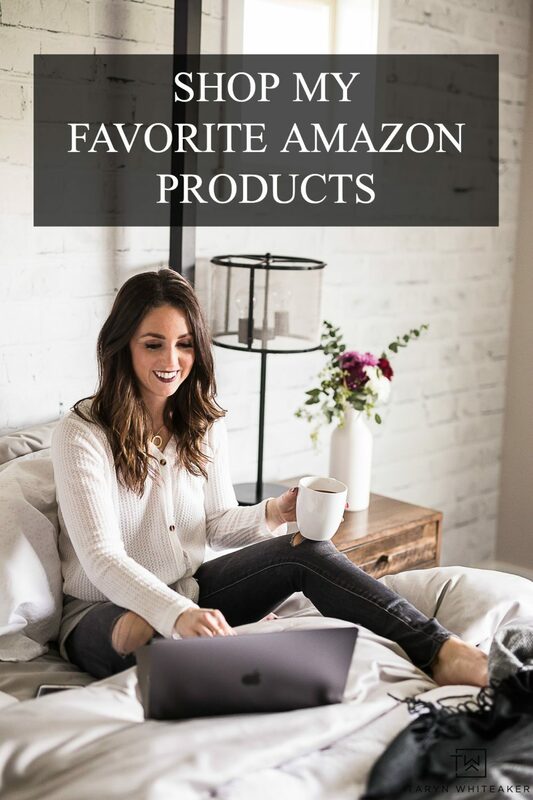 I think they are so realistic looking and the best part is I just pack them away and don’t have to buy them again every season! I have never used millet before. I have actually never even really noticed it before until this year. I was at the local nursery picking out plants for our huge landscaping project (I’ll blog about it soon!) and these millet plants caught my eye. I loved how they resembled corn stalks and had this beautiful deep color to them. I knew I wanted them to be part of my fall decor this year. These flowering kale plants are one of my favorites for fall. They add the perfect splash of greenery to the look. Have you decorated your porch yet? Keep scrolling to look through 13 other fall porches. Each one is unique and beautiful. 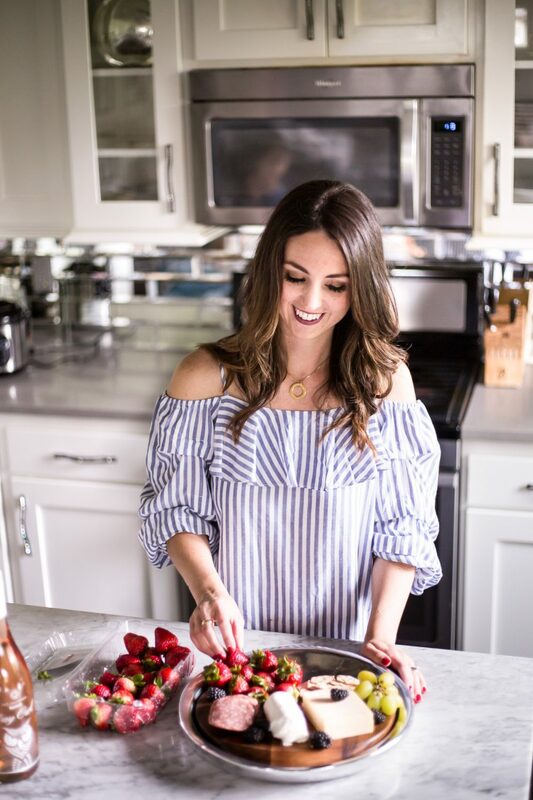 I love seeing how everything decorates for fall! So pretty, Taryn! I love the layers of neutral and metallic pumpkins! 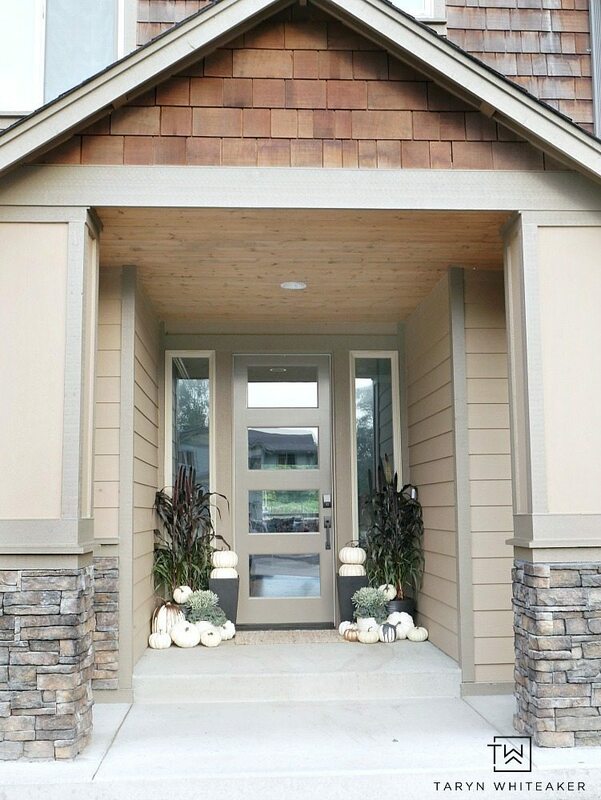 It all goes so perfectly with the front of your house! So pretty! Beautiful Taryn! 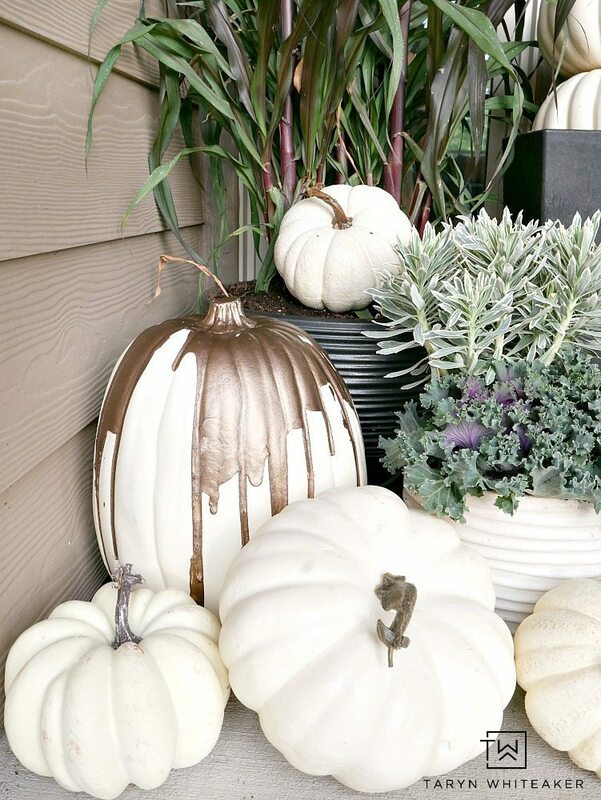 I love the paint dripped pumpkins and all the metallic tones. Thank you for hosting! So beautiful Taryn! Love the green in the planters against the white and metallics. Really lovely, Taryn! I’m a white pumpkin fan as well. And I love your idea of using the millet instead of cornstalks…..so unique! Fantabulous porch! Love those metallic pumpkins. Everything looks beautiful! Beautiful porch, Taryn! 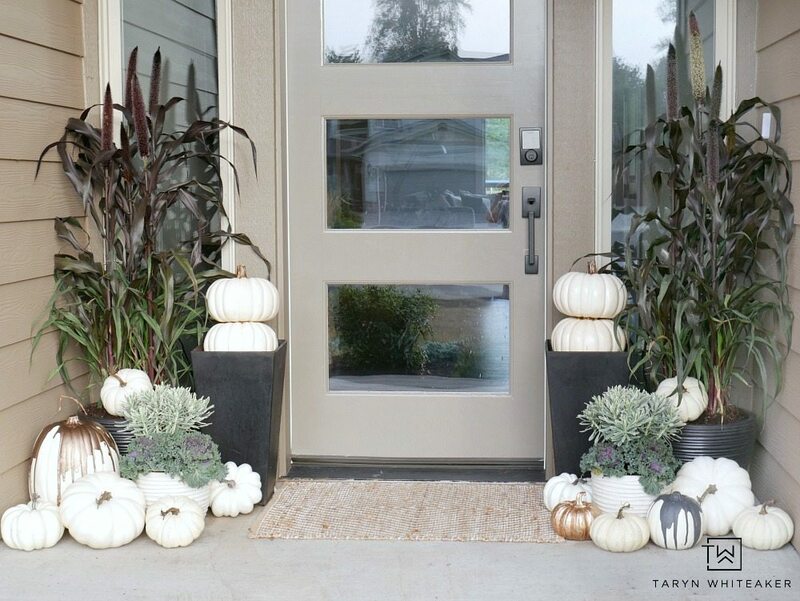 Love the pops of green with all those white pumpkins! Your porch looks gorgeous Taryn…very classy! And I LOVE your paint dripped pumpkins! Love your styling Taryn!! That millet was an awesome choice!! Happy Fall friend! Beautiful, Taryn! It is totally elegant and charming!! Those grasses are amazing, and I love your paint drip pumpkins! Thanks for all your organizing! Wonderful varied presentation on your front porch Taryn. Keeps the eyes looking from one object to another. Love that kale and all of it. Had no idea what millet grass was, really pretty. 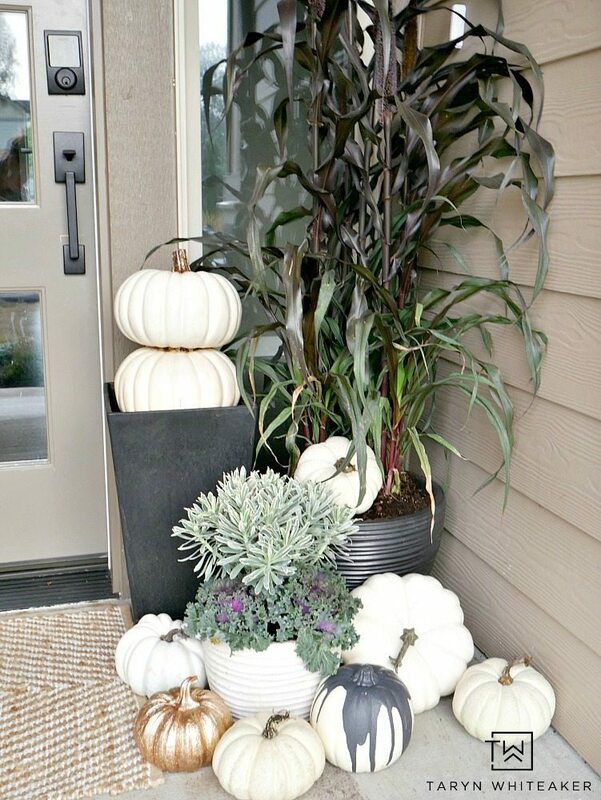 I too love the white pumpkins with misc. decorations on them. Haven’t done any front porch or interior decorating as yet. Mr. Furry requested a later introduction of Fall decorations last year than what I used to do. So will wait now til end of September before I get started on living room. Front porch maybe in next few days. Depends on weather, has been blowing like crazy and some hard rains so don’t want what I do to get ruined. When it blows out here is like a tornado, no kidding. Had been working on items for a craft show but realized is getting to be too much for me. Either keep house clean and tidy or work on craft items, can’t seem to do both anymore without exhaustion, price of being 77.Hard to admit but life is as it is. So will call venue tomorrow to let them know. Mr.Furry didn’t really want to do show, knows how I am. Thought about it all day then told him, he was relieved. I will make some new decorations I got from a wonderful botanical blog hop was lucky to come across this week. That will be more than enuf with what I already have.